This bridge is a major portion of the LA 1 highway near Leeville, Louisiana that extends for 18 miles. These low-level and medium-level bridges cross over the state’s extensive and sensitive wetlands. When completed LA 1 will be the longest bridge in Louisiana and nearly as long as the Pontchartrain Bridge in New Orleans. The project had been previously bid and the two bids that were received were both over the owner’s $100 million estimate and thus rejected. FINLEY performed a review of the bridge design, reviewed contract documents, and provided recommendations on how to improve the project’s constructability in an effort to reduce costs and attract more bidders. FINLEY’s Value Engineering Design repackaged the bid into more efficient and smaller projects. FINLEY prepared construction estimates and schedules for each of these projects: Phase 1A, the Fourchon to Leeville Bridge; Phase 1B, the Leeville Bridge and Connectors; and Phase 1C, the main span unit over Bayou Lafourche Channel. The total project length is 9.546 miles with 9.007 miles of bridges. For Phase 1A the bridge is 26,550 ft.-long, and the contract requirements include that this bridge be built using a “top-down” construction method. 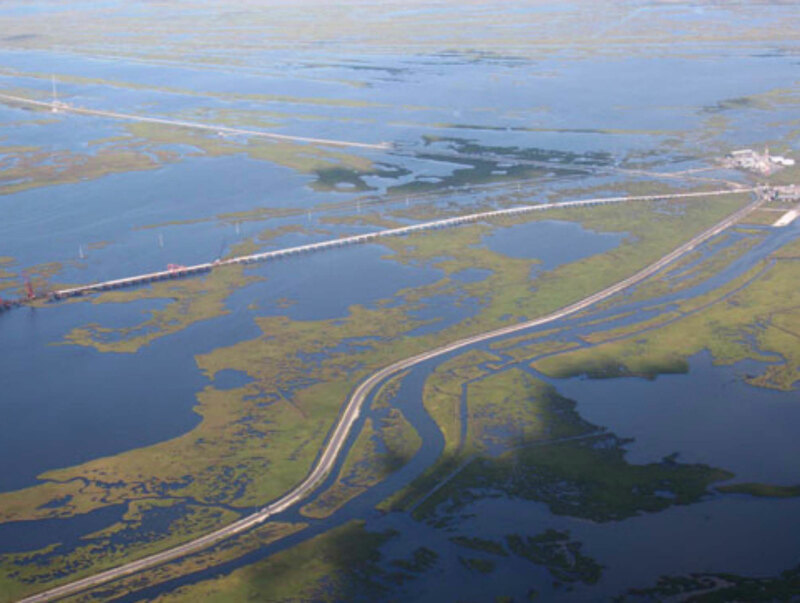 Phase 1B has three sections as a part of this bid package: the mainline structure, located on either side of the main span unit over Lafourche Channel, which is 12,738 ft.-long; the South Connector; and the North Connector. The main span unit over Lafourche Channel, Phase 1C, is 870 ft. long. The three smaller bid packages were estimated to be under the budget and ahead of the original schedule. FINLEY’s efforts saved the owner $35 million and 14 months of construction.